Why Sweet Feet? The health benefits of sweet potato and the benefits to runners (race prep and recovery) really intrigued me. Also, I grew up on a farm in Eastern NC so it was right up my ally, so to speak. Favorite Race: The Chicago Marathon, which I’ll be running on October 7th. What got me running: Running is a great way to stay active and healthy and participating in races is such a great motivation milestone. The running community is full of great folks that keep each other motivated. 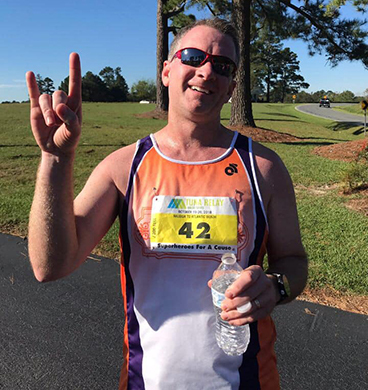 A little about me: I graduated NC State Engineering in the mid-90’s, enjoy being outdoors and running. When I’m not running, I also enjoy playing acoustic guitar and playing live music. I live in Clayton with my wife of 21 years and my 2 children.